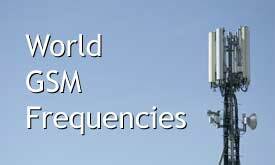 List of GSM frequencies for each country around the globe. Check here to see if your mobile phone will operate on the local frequencies. Not all will operate globally. Will yours? Though the frequencies used around the globae are known, not every phone is capable of dealing with all of them. So it may happen that your phone doesn't work. The best way to find out is to check your manual for the frequencies supported and then check what frequencies the country has. If you know you have a quad-band mobile phone, you'll most likely be fine anywhere in the world. If your phone is not compatible, you might want to consider buying a cheap/used one that is suitable. This also eases the pain if it should get stolen on your trip. You might also want to check if your carrier provides roaming in at your destination (which means: besides the technology, does your contract allow your international calling). A hint for flexible travellers: consider buying a local prepaid card (or one of these international ones). They can be much cheaper especially if you stay longer.